You can setup your elements as a multiplane to create a parallax effect when moving your camera. You simply need to spread and scale the objects on the Z-axis. Click in the view, and drag the cursor around to rotate the view or press and hold Ctrl + Alt (Windows/Linux) or ⌘ + Alt (macOS) and click and drag to rotate the view one axis at a time. In the Tools toolbar, select the Transform tool. Make sure the Peg Selection Mode option is disabled in the Tool Properties view. 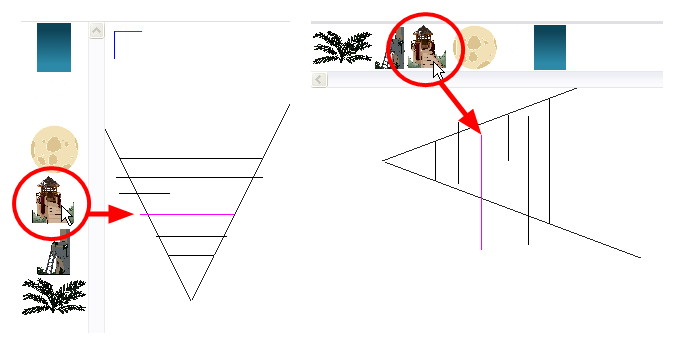 In the Advanced Animation toolbar, select the Translate tool and select a layer from the thumbnails section of the Top or Side view. Select a layer from the Timeline view.